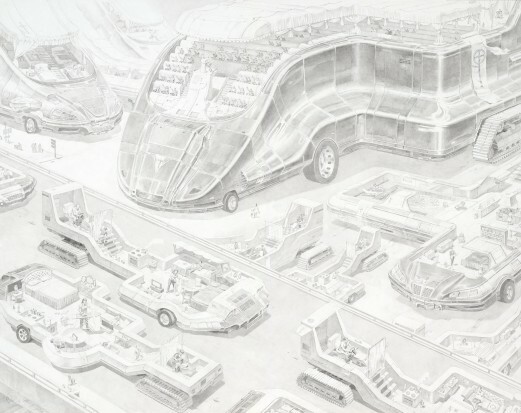 In Steven C. Harvey’s solo show entitled Vehicles, the artist presents new drawings from the series by the same name that he has shown in his solo show in MUDAM Luxembourg in 2012 and in 2013 at Visions: an Atmosphere of Change at Marta Herford Museum, Germany. In 1963, science-fiction writer J. G. Ballard claimed that he had rejected outer space for what he called ‘inner space’; he declared that ‘the dream worlds, synthetic landscapes and plasticity of visual forms invented by the writer of fantasy are external equivalents of the inner world of the psyche’. It is from this ‘inner world’ that the dystopic pencil drawings of Steven C. Harvey emerge. The artist’s science-fiction vision is of a dark, unsettling world dominated by machines and mutant technology. But his intensely detailed images are not predictions of a far-off future; rather, they reflect a personal take on a monstrous present. According to the artist these drawings stand as ‘reports from the filth-strewn construction site of the new, stalled Tower of Babel’. The world of science fiction and the design of planes and cars in the 70s promised a utopian future in which technology would create a modern wonderland populated by flying vehicles and all kinds of wonderful inventions to ease societal ills. Yet that future did not only never materialized but it ended up becoming a threat for the survival of nature, mankind and humanity in view of the real overwhelming power of technology and the unfettered waste of resources. This disappointment, combined with an interest in our ambivalent relationship to technology in the 21st century, propels Harvey’s ingenuity driving him to create ever-more fantastic and absurd machines. Man-made environmental disasters, the looming threat of fuel shortages and the exploitation of the developing world are just some of the concerns underpinning Harvey’s recent Vehicles Series, which offers a social commentary on contemporary issues based on Francisco de Goya’s motto “The dream of reason produces monsters”. As Clement Minighetti, Chief Curator of MUDAM Luxembourg, argues “Harvey’s extremely detailed drawings have a visionary force which is reminiscent of the Carceri (1745) by Giovanni Battista Piranesi and the Caprichos (1799) by Francisco de Goya...".The artist combines his influences from Bruegel and Goya with biblical references from Western Christian art history which only serve as an aesthetic camouflage of those who use religion to justify all kinds of questionable activities. Most of his giant vehicles seem like contemporary arks picking-up animals that instead of being saved from the flood or extinction they rather seem to be on their way to the abattoir. Human beings in his works seem to be either submissive slaves or diminished to a secondary role as opposed the vehicles’ magnificence. However, Harvey’s glorious and impressive, in terms of engineering, machines are actually paralyzed absurdities that could never function in the real world. This is a way for the artist to comment on “the unprecedented moral schizophrenia of 21st Century man, a man of good character reliant on the spilling of innocent blood and toxic effluent, haunted by the chiding ghosts of his own cautionary myths”.